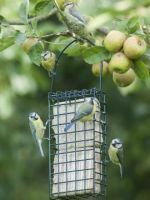 Many birds love mealworms all year round.Feed straight from the bag or soak for 10-15 minutes to re hydrate them.I now purchase mealworms in bulk sacks and will weigh out your order into a bag.This means I can keep my prices lower than garden centres and other outlets.You may need to keep an old tub and refill it. We typically offer mealworms in 5 pack sizes,100g,500g, 1kg ,and 5kg but can do any other sizes as required right up to the whole box size of 12.55 kg.. Freeze dried Mealworms Per 1Kg or more. Freeze dried Mealworms 12.55kg box super saver!